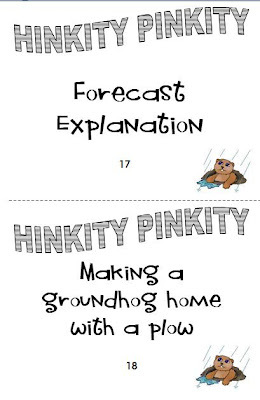 This is the last post about Groundhog Day, I promise. Words and word play are really my thing. I love enticing and intriguing my students to increase their vocabulary through fun activities. My students and I just love Hink Pinks, Hinky Pinkies, & Hinkity Pinkities. If you've never encountered Hink Pinks, etc., you are in for a treat. 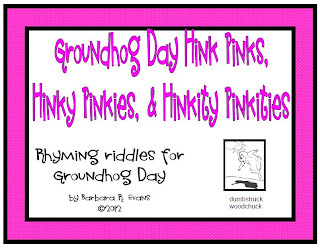 Hink Pinks are rhyming answers to riddles. 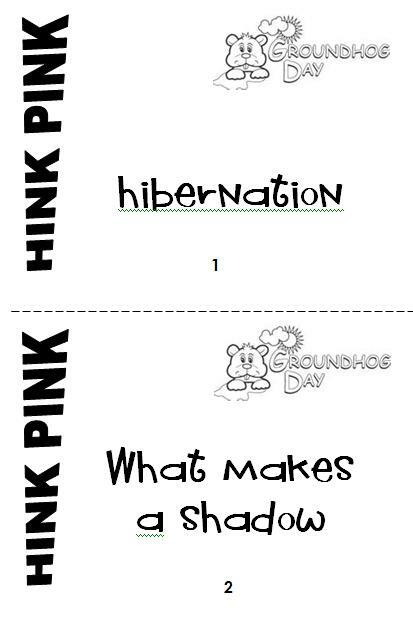 The answer is a Hink Pink if both answer words are supposed to be just one syllable. If the riddle calls for 2 syllables in each answer word, it's called a Hinky Pinky. You've probably already figured out that 3 syllable answers are Hinkity Pinkities. Several years ago, my enrichment students begged to know what a 4 syllable answer would be called. Never having encountered one, I let them name such pairs. Voila! Hitinkity Pitinkities were born. Then, of course, I had to quickly create some riddles with 4 syllable answers. Good brain exercise for me! 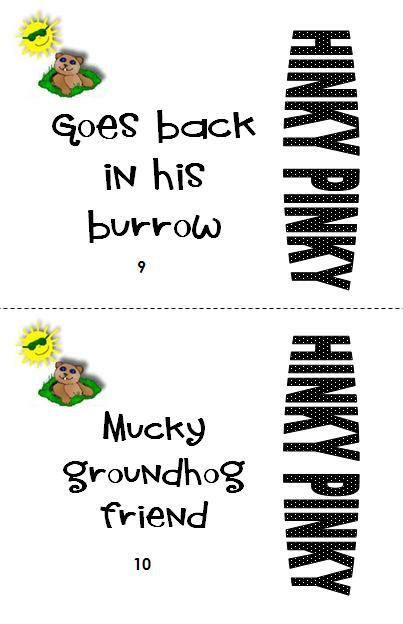 I've designed my clues to be on cards that I can use at a literacy center or at a large or small group meeting. Note that the "Hink Pink" logo appears on the cards so that students know what number of syllables to be thinking about. In the above examples, the answer to #1 is deep sleep. #2 is bright light. Pretty fun, huh? The answer to #9 is rehide inside. Muddy buddy is the solution to #10. #17 is prediction description, although I would also accept prediction depiction. Furrow burrow is the answer to the last one. Your students will love working on vocabulary, parts of speech, synonyms, rimes, making inferences, and interpreting data when they are disguised as fun. Mine clamor for more everyday. You are welcome to download this freebie here. If you visit my store, you will see that I'm a bit obsessed with these word riddles. 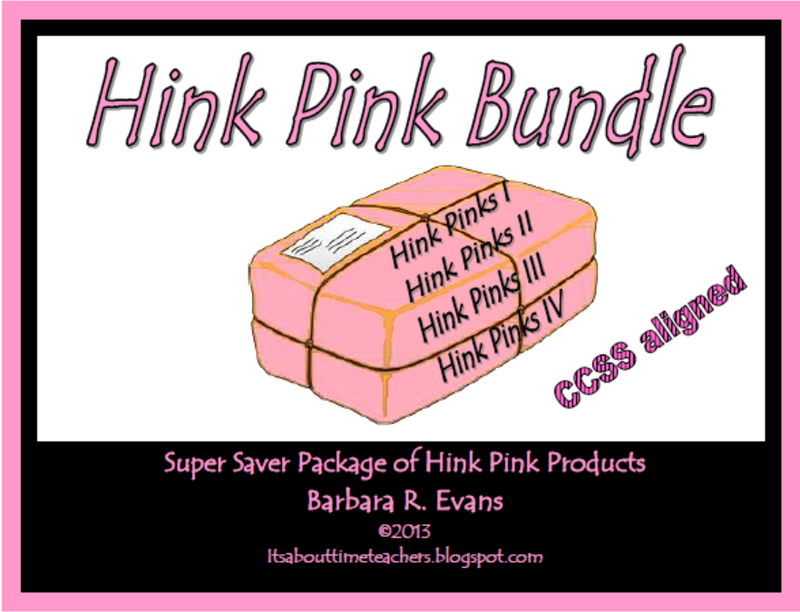 There are currently 24 more Hink Pink products listed here. All of these products bear the same logos on the cards and are print ready. I recommend copying them on card stock and laminating them before cutting them apart. Then you will have ready-made fun for years to come. Enjoy!